I, the mighty and astonishing wizard Fella'Fel, in accordance with the meticulous methods of Meticles in chronicling... I can't keep that up. Dear diary, it's me, Fella. When Harold and his wife, Inska, came to me with their conception troubles, I was only too happy to help. The problem was immediately clear. 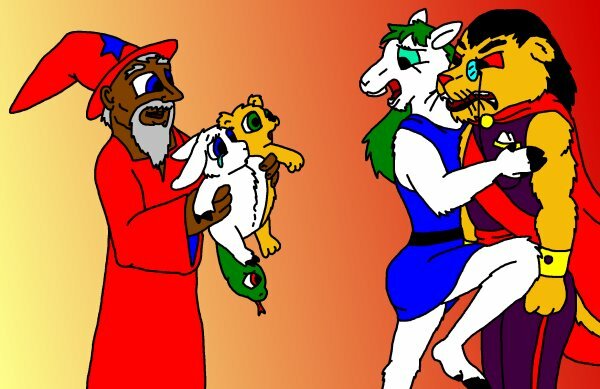 After all, they may both be pookas, but he's a lion and she's a goat. When pookas of such diverse species attempt to breed, there's a 25% chance of the child having the mother's species, 15% chance of the father's species, 10% chance of something completely random and 50% chance of total infertility. The solution was obvious: throw a bunch of magic at the problem. After harvesting sperm and egg, I applied a hocus pocus, a bibbidy boppity boo, and for good measure, a Frippin at the krotz. I suppose I krotzed when I should have Jim-jammed. I managed to produce a youngling in my magical test tube, but was not exactly what the parents were looking for. It's not a bad baby by any means. I know it will be fine with a little extra love. Unfortunately, both parents ran away screaming. I am hoping to find a good home for this little... uh... happy accident. In the mean time, I am placed in the awkward position of having to find diapers with a neckline.